Reservations should be made as far in advance as possible. Dates will go quickly so book now. Prices listed are for freshwater & saltwater guided fishing charters and wildlife/eco-tours. Families and children under 16 years of age receive an added discount with my guide service. Please call or e-mail for details. My guide/charter service owns and operates several different types of boats. We can accommodate large parties, families and corporate groups. Please call or e-mail for details. 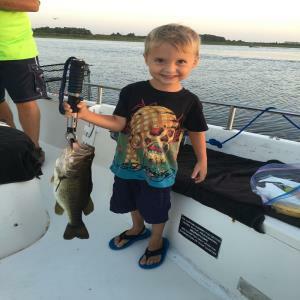 Little man's first Lake Toho bass. Hooked and reeled in all by himself, along with many others. Book us! Kids fish free!